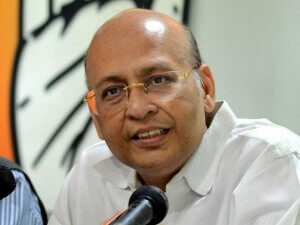 Dr. Abhishek Manu Singhvi, MP and Spokesperson, AICC addressed the media (In English). Dr. Abhishek Singhvi said, I think pocketing the subsidy meant for farmers is the cheapest worst form of fraud. This Government has done many frauds, but the most reprehensible form of fraud is to cheat your farmers. In a nutshell, very-very briefly- A public sector which is called GSFC which is a fertiliser kind of a focused company – 100% owned by Public Sector – 38% directly by Gujarat Government – rest by Public Sectors, which had on its Board of Director’s all the top Gujarat officers who are now Secretaries to the Government of India from Gujarat cadre in Delhi. The Central Government gives the subsidy. It is found in 2012, particularly in 2013, that the subsidy is mis-utilized, does not reach the farmers. I give the subsidy to GSFC, GSFC is supposed to distribute it to the use of farmers, it does not reach. That is virtually embezzlement or window dressing of accounts; it is shown in your revenue account to show your profits higher. So, if I give you a subsidy, instead of distributing it, you show it as revenue, so that your account looks good. UPA finds this out and stops the subsidy in 2013. From 2014 to now, Mr. Modi and his Government do nothing about it and a court case is going on for irregularities by the Central Government against GSFC for the last four years. Suddenly, and it is not so sudden, it is understandable why the suddenness occurs, because Gujarat elections are there, you want to see everything through a political Prizm, through cheap politicking, to mislead the people You suddenly wake up and say (a) we will settle the court case, out of court settlement (b) we will reward your irregularity by starting the subsidy all over again (c) we will even think of compensating you for the three years your subsidy was stopped from 2014 to 2017 (d) we will claim before the Janta of Gujarat that what a great company GSFC is, its making good profits, running well. This is nothing but playing with ordinary people and thinking that everybody else is a fool and we along have the cat’s whiskers. It is the worst form of deception, it is the worst form of chicanery – Rs. 986 crores was the irregularity on the basis of which this subsidy was stopped, almost a 1000 crores and not distributed to the farmers, used to window dress the accounts of GSFC. No credible explanation has come as to why this Government has suddenly restarted it except that elections are around the corner. We are here to expose this story of deception. It links with the story of deception which we have very often repeated to you. But, I must repeat now to remind you of the continuity, the other company was GSPC where on 31.03.2016, an earlier report of the CAG report was finally tabled, actually 2015 report, in the Gujarat Assembly, which showed that yet another Public Sector called GSPC (Gujarat State Petroleum Corporation) had surrendered 45 out of 64 Gas Blocks – 70% of Gas Blocks owned by this, the most valuable property – the cash-cow, was surrendered by GSPC, a loss which the CAG estimated as Rs. 1757 Crore – some people say it is close to Rs. 3,000 crores – have you received an answer for the last 1½ – 2 years on this? – No. (a) Did Modi Ji’s Gujarat Government, GSFC the Gujarat Enterprise under the benevolence of Central Government inflate its revenue accounts, balance- sheets to show it by window dressing how Rs. 986 Crore is a revenue entry and not subsidy to be disbursed. (b) We question through you – is this a reward by the Government of India by restarting the subsidy for mismanagement of a subsidy in the past. This is the kind of reward you give. (c) How did you suddenly think of an out-of-court settlement after three years? You did not think of an out of court settlement in 2014, 2015 and 2016, now only because Gujarat is having elections. (d) In a similar case, Government of UPA had stopped subsidy of another Central Company called Rashtriya Chemicals. Then UPA Minister had taken that point. Mr. Modi, we will ask – why don’t you restart that subsidy also, because Rashtriya Chemical does not function in Gujarat, because there is no election in the Central Government otherwise Rashtriya Chemicals subsidy also would have started. Last but not the least, what about the poor farmer in your actually politics? (a) that poor farmer never got the subsidy then, we had to stop it for mismanagement He is not getting the subsidy now when you are politicking with the Gujarat elections. If you have to give subsidy, it’s very simple, use Direct Transfer through DBT or Aadhar or whatever. You do not have to go through GSFC. So, this is the ‘Chal, Chehra and Charitra’ – the true object which is duping, deception, dishonesty and duplicity. They are the four Ds, the four D pillars on which the dubious character of the BJP rests. There is absolute chicanery with the people of India thinking that everybody is a fool and they alone – the Government of Gujarat and the Government of India alone – have any brains. A brief comment on the Gabbar Singh Tax – It is the worst example globally of a noble conception how quickly it can be distorted to a nullity, out of arrogance and obstinacy. Remember, the same thing could have been done after 6 months delay, after setting everything right. Even a small set of three or four pilot projects could have been tried in North, South, East and West India – set the glitches right and then bring in fully. But no, we have Zid, we know best, we will not listen to anyone. What is the result? Today the meeting is going on and I am making this comment only because to dispel the absolute campaign of calumny and misinformation spread, that all the State Governments around the country are clapping and everybody is gung-ho and agreeing and consensually agreeing. We have letters in writing not only from many Congress States including Punjab and Karnataka but many Non-Congress States. The four or five basic issues on which the letters have addressed the GST Council, I am sure there will be some populous changes because of Gujarat Elections, but a GST Council Advising is being held in the middle of the Model Code of Conduct operational in Gujarat. Himachal may have ended, but it is a very nice time to call a GST Council Meeting in the middle of elections in Gujarat. (2) where is one Nation also? One Tax, it is not, but where is One Nation when 40% of the Nation is kept out of GST in value terms, is not a GST if you aggregate Petroleum, Reality, Alcohol etc. (3) the most important is how you set right your ITs? I do not want to get into details, but the number of forms required, people are now getting extensions adhoc basis every week, every month, because nobody can file the forms within the time stipulated. (4) Agriculture which is reeling under protest on this from Gujarat and Maharashtra to elsewhere, most of the vital implements and instruments of agriculture are taxed at the very high rate of 12% and in terms of Agriculture or 18% Tractors and instrument like that are 12%, cold storage in the entire food processing chain 18% This is hardly rationalization and in the rationalization game you see it requires time, rationalization requires application of mind, the Government, the Prime Minister’s Government, the Finance Ministry functions on the basis of Shoot first, take aim later and think last. The sequence should be reversed – think, aim and then shoot. Today you have got the very strange piquant situation; it is a very serious situation because there are no free lunches. It will show in the next budget or next to next budget. The expectation was that 5 to maximum 7 States will ask for compensatory money because the GST will be lowering that tax inputs or takes. The quaint thing is that 4 or 5 States alone are not asking, all the other 31 States are asking. Now, if you start compensating, where will you get the money from? Somewhere a hidden tax, assets and because of arrogance, because of rhetoric, scoring a debating point is not always right, you are actually not addressing these issues. I gave you the anomalies which are many e.g. fabric attracts a tax of 5%, the end product the fibre is the fabric attracts a tax of 12%. So, the Raymond Fabric is 5%, a person in the prior part of the chain is 12%. These are anomalies which require proper application of mind not arrogance that I am right, I exist, so I am right. 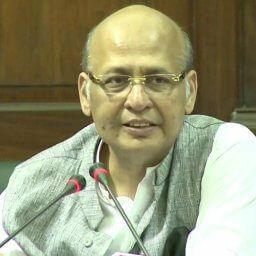 On the postponement of winter session of Parliament, Dr. Singhvi said it is a very serious question you are asking and do not under estimate your own question. It is serious. Have you had elections in Gujarat or around the country for the first time? Is 2017 for the first time having State elections? We have had elections every year. 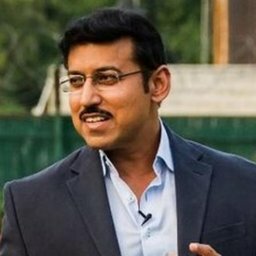 Well is Gujarat elections suddenly so paramount that National Parliament must be postponed because the date of postponement is unknown. There is no date announced. As far as I know as per Article 211 no notification has come to MPs. I am a Member of Parliament; no notification has come. So where is the question of postponement? Secondly, you will then issue a notification in the middle of December to sit over New Year’s up to January. Thirdly, you are perhaps planning a 5 or 7-day tokenism. Fourthly, who is helped by the tokenism – is Jai Ho helped or Veer Shaurya helped? Important issues of national importance are going to be debated without Parliament, it helps people who do not want those debates and where is the new Model that for one State election, Parliament is changed. Who was consulted? I think it is a very serious thing; you are under estimating the importance of your own question. Doesn’t matter this government or that government, there will be elections every year. If in Madhya Pradesh elections they say why you must not have the session at all at that time. Why to discriminate between the States? This is absolute Tughlaki adhocism.